The fourth part of this alphabet is posted on the RPW 2016 page here. While working the chart there have been some missing rows and miscalculations of the number of stitches this week. It takes around four hours to work them, by two hours tiredness creeps in, this leads to these mistakes. At this point, I am not interested in rectifying them. My sampler might not be one of the many! It took some time to work the alphabet chart on RPW 2016 challenge, but it was completed the next day. We have two week’s stitches on TAST 2016 challenge. Both were worked earlier. Interesting variations of raised chain stitch over straight stitch rows. The link to the samples were posted on FB group. This project is moving quite slow, because of the size of the squares. This pace is fine. The bigger diamonds are being worked with pink thread. 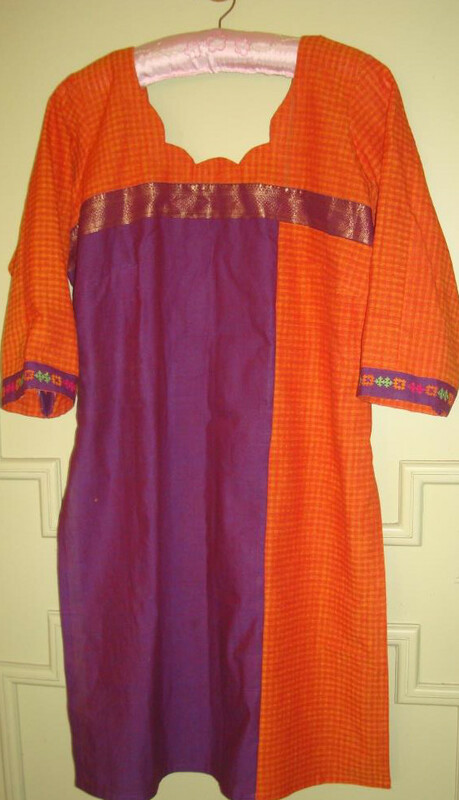 The same colour scheme on the sleeves is to be adopted for rest of the embroidery on this orange and violet combo tunic. Starting with orange and yellow on this corner design. The beadwork on the beige tunic with mirrors was completed. 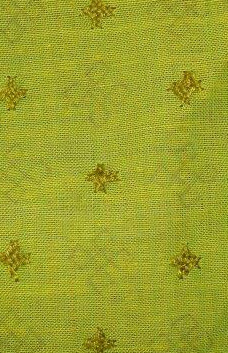 Last week a copper mangalagiri fabric with zari border was given to the tailor to be sewn as a tunic for a readymade Patiala. It came back with a very creative yoke made of zari borders. This is definitely a surprise. But still not sure whether it is pleasant or unpleasant. Something needs to be done, with an idea- if it works, fine. If it doesn’t, the front can be concealed by the dupatta. But the tailor seemed quite thrilled with his innovation. We are still continuing with the same alphabets on this week’s chart on RPW 2016 challenge. the chart is here. I think we don’t need to use codes to write with this style! Each and every letter if seen individually does not bear a resemblance to the real English letters. Seen together here, we can see some similarity, I suppose. The Randje per week2016 chart of the week was completed on Saturday. This week’s TAST stitch is inverted feather stitch. Looking at the earlier worked sampler does not give me much satisfaction, the stitches don’t look good at all. But still the link was posted on the FB group page. Now that the green thread has come into the project last week, I decided to move on to the yoke with the green. The orange fabric on this tunic has woven checks. It is to be left as it is. The embroidery pattern was traced on to the violet fabric. All the square mirrors were worked on the beige tunic. The last part in this project is the beads. Brown metallic beads were attached on the sleeves. At this point, there does not seem to be any embroidered tunic fabric ready to be given to the tailor, some fabric which may not require embroidery has to be chosen. I had bought this ready to wear Patiala with the matching dupatta. 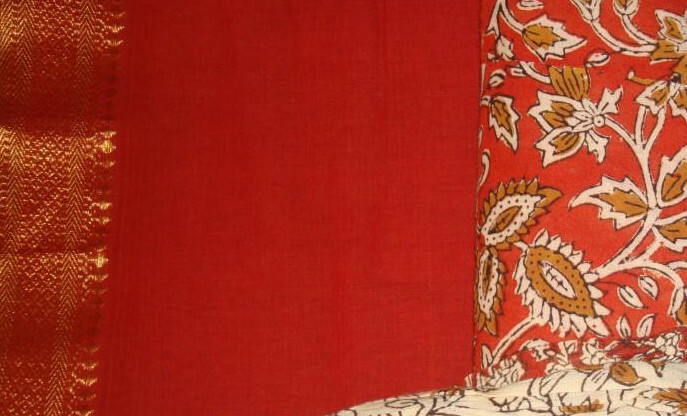 A mangalagiri fabric of the base colour of the Patiala is given to the tailor to be sewn. This week also we are continuing with the same alphabets. They are definitely different. The half crosses on the last three letters, were first worked with the help of the chart and afterwards completed. this seems easier. The chart is available here. This week’s progress was very slow. The Navrathri festival was in full swing. The RPW 2016 challenge chart of the week was completed yesterday. Not regular Alphabets characters at all. the chart is here. Link to the woven detached chain stitch samples was posted on TAST FB group page. The orange and violet combo tunic was sewn. The embroidery on this tunic will start after the projects in progress are completed. 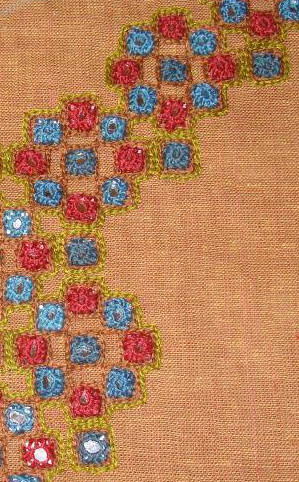 A row of single kutchwork border was completed. Just worked a few more mirrors on this beige tunic. The beige linen fabric is given to the tailor for marking the neck and sleeves. Till now there is no idea of embellishing the sleeves, but will wait and see. A single row of small mirrors could be possible. But everything depends on success in transferring the design on to the fabric and the time taken to work this medium sized yoke. If there is better progress this following week, I’ll be happy. RPW chart really dragged this week. The kutch work on green was not very easy. maybe these factors are the cause of restlessness. This week’s Randje per week challenge chart had numerals. They were easy to work. This week’s stitch on TAST challenge is slipped detached chain or tulip stitch. the link to the samples worked earlier was posted on FB group page. The kutchwork embroidery on Cream kalamkari patch work tunic was completed this week. 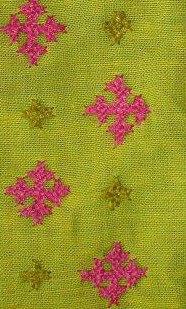 The sleeve border design is made of three rows of kutchwork on this green fabric. The part I am working is in pink thread and is in the centre and bigger than the other two rows. The other two rows are to be worked in green thread. This work being intricate is worked in segments. The kutchwork design is quite simple. The central part of the border of one sleeve was completed. The kutchwork elements in four colours constitute the border for the sleeve of this orange and violet combo tunic. This is the first segment of this project. Rest of the embroidery will be done after the tunic is sewn. The beads are added onto the mirror worked sleeves. Following this, the tunic front will be worked. Now that the tunic is sewn, the embroidery can be done at leisure. A medium sized yoke design is drawn on graph paper during this week for the beige linen fabric. 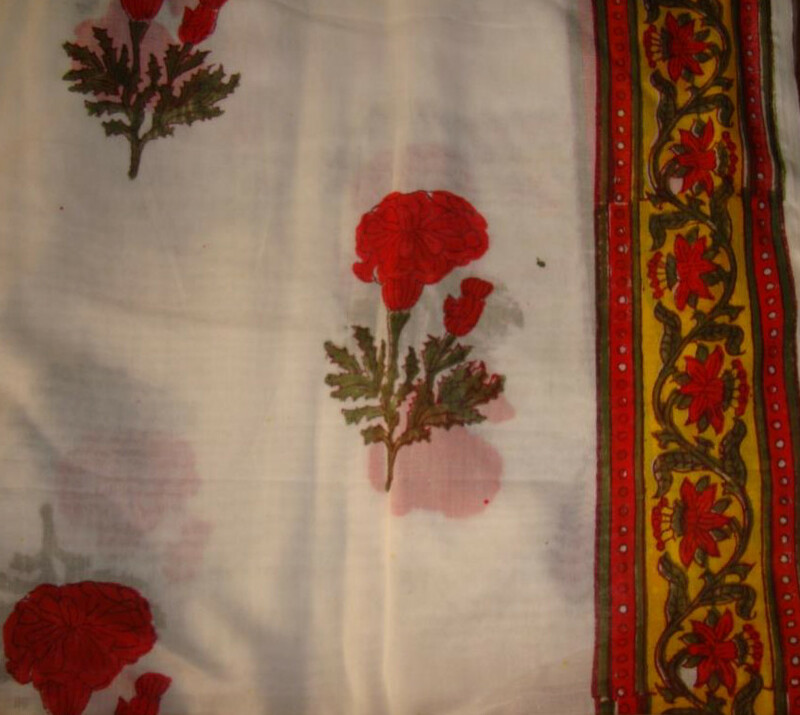 I have a red salwar which needed a tunic to make it into a set. I found this printed cotton mull fabric. At this point, there is no idea to embellish this tunic with embroidery. I need some casual wear. Just a desire to share the picture.